Benjamin Chinitz, a nationally recognized urban and regional economist who counseled three presidents, died Monday of pneumonia at Hebrew SeniorLife nursing home in Roslindale. He was 84 and had Alzheimer's disease. Born and raised in New York City, Dr. Chinitz strayed from family tradition by not becoming a rabbi. After graduating in 1945 from Yeshiva University in New York and serving as an Air Force sergeant in the Philippines until 1946, Dr. Chinitz moved to New England to pursue an education in economics. While a student at Brown University in Providence in 1950, he married Ethel Kleinman, whom he had met when relatives set the pair up on a date. The couple settled in Newton and had two sons. Dr. Chinitz received a master's degree in economics from Brown in 1951, followed by a doctorate in economics from Harvard University in 1956. Upon graduation, Dr. Chinitz began a three-year stint with the New York Metropolitan Region Study as a transportation economist and developed a keen interest in urban and regional economics, or what he called his "permanent identity" in a 1995 article in Eastern Economic Journal. "They were intellectual issues that affected the everyday lives of people, and he felt that he could make a difference in the lives of people as the economy changed and the landscape changed," said his son, Michael of Newton. From 1959 to 1965, he was a professor of economics at the University of Pittsburgh. While there, in November 1963, Dr. Chinitz sat in the White House Cabinet room with President John F. Kennedy, 10 days before Kennedy was assassinated. Less than a year later, he was invited to join President Lyndon B. Johnson's task force on transportation policy. During the Johnson ad- ministration, Dr. Chinitz was deputy assistant secretary for economic development in the Department of Commerce from 1965 to 1966. From 1967 to 1973, he taught economics at Brown. While there in the spring of 1970, Dr. Chinitz returned to the White House and advised President Richard Nixon on urban policy. "He was very optimistic . . . with his work and general outlook in life," said George Borts, who worked with Dr. Chinitz at Brown. "Economists are generally thought to be pessimistic; it's the nature of the field itself. It lends you to think in terms of examining . . . the malfunctioning of institutions," said Borts. "But he was more of a creator than a critic." After serving as an economic adviser to Governor Frank Licht of Rhode Island from 1969 to 1972, Dr. Chintz was a professor of economics at the State University of New York at Binghamton from 1973 to 1982. That overlapped with his position as senior vice president of Abt Associates, a Cambridge think tank, where he worked from 1976 to 1980. From 1982 to '87, he served as dean of the College of Management at the University of Massachusetts at Lowell. 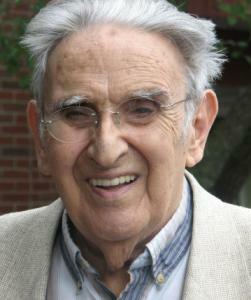 From 1987 to 1990, Dr. Chinitz was research director for Lincoln Institute of Land Policy in Cambridge. Throughout his career, Dr. Chinitz published books and papers, including "Freight and the Metropolis" in 1960 and "City and Suburb" in 1965. Known at Brown for hosting networking parties for students and at UMass-Lowell for bringing national accreditation to the College of Management, Dr. Chinitz inspired his students and his colleagues. When asked to speak at her retirement luncheon a week ago, Susan Jacobs could only think of Dr. Chinitz, her former economics professor at Brown, who had motivated her to work for the federal government more than 30 years ago. "I said something [he] had once told me: 'You know you have a good job when you wake up and think, I couldn't imagine having a better job to go to,' " said Jacobs, of Silver Spring, Md. "I was fortunate to have a job that met that test." She added: "He was devoted to making improvements in his field. He was not just a textbook professor." Dr. Chinitz devoted a lot of his free time to improving Jewish education, particularly in Providence and Boston. He was also a lifetime trustee of Temple Emmanuel in Newton. Besides Michael, Dr. Chinitz leaves another son, Adam of New York City; two brothers, Jacob and Zelig, both of Israel; a sister, Helen Wohlgerlenter of Philadelphia; and three grandchildren. His wife died in April 2006. A memorial service will be held today at the home of Michael and Karen Chinitz.